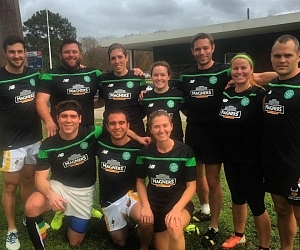 Touch Rugby is back this summer with two sessions, including adult and youth co-ed leagues! Rugby is Football without pads; Touch Rugby is Rugby without broken noses! The game is played by 2 teams of 6 players. Points are scored by placing the ball in the end zone. We call this scoring a “Try”. To get the ball to the end zone, you must pass backwards only (sorry aspiring quarterbacks!). The ball is progressed by running it forward. Tackling is very similar to flag football; a defender must “tag” the offense. In the event of a tackle, the defense must back up 5m from the ball while the offence places the ball on the ground and a teammate picks it up to continue play. If the defense does not back up the full 5m before the next tag, a penalty will be called. On the 6th tag, possession is turned over to the defense. Dropping the ball, accidentally passing forward or any other infringement of the rules results in a change of possession. Games are 45 minutes long; 20 minute halves and 5 minute half time. The league is a round robin style with matches every Wednesday. Teams can expect to play every Wednesday of the season. There will be at least 2 games played per week. Team with the most points at the end of the season, wins. Team check in is at 15 minutes prior to kickoff. Youth league kickoff at 5:30p followed by adult league at 6:15pm and 7:00pm. Teams must have enough players to put a team of 6 on the field. Teams must consist of between 6 and 12 players. You must have a minimum of 2 females on a team. Youth teams will be split up at the beginning of each match. Each team must have 6 players on the field at a time, 1 of which must be a lady. The league will provide uniforms for all players and each team captain will receive a touch rugby ball.